Here is a duo of early medicines which might look familiar. At first glance they look like an aqua and yellow amber Pratt's New Life...right? The colored New Life's were virtually unknown until the "big dig" of 1998. At that dig, there were 25-30 of the New Life's dug, with maybe 10 being undamaged in any of the color variants. There were a handful of aqua examples found, about four in an orange amber, a dozen or so yellow amber's and five puce specimens. 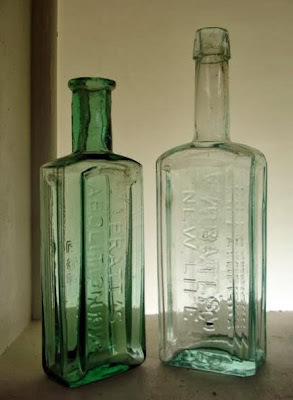 These are still rare bottles in any condition, but very rare in mint condition...no matter what the color.
" A. McBoyle & Co. San Francisco". The font is identical although the letter spacing is a tad bit different. I would be interested in knowing how many more of these are out there. 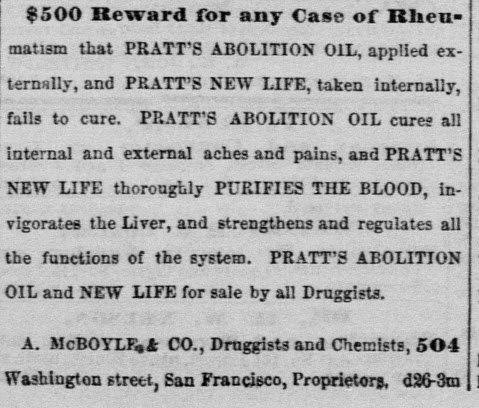 Dale M.
I don't believe I've ever seen that style of Abolition Oil either. A very nice pair of medicines you have put together! Thanks for the look. Thanks for the additional info on the Pratt's. 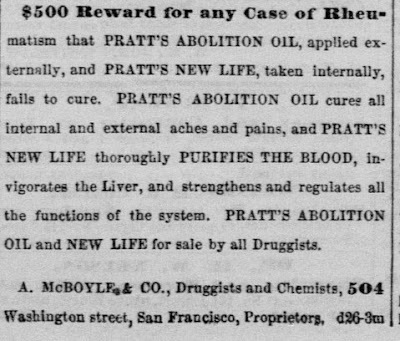 I simply have not seen this variant of the Abolition Oil before. There are at least three different versions of the New Life including the unique large cobalt example, an aqua tooled version, and the colored as well as aqua applied top variant. As for the Abolition Oil, there is the standard and early rectangle with the backwards "S", the taller flared lip flat base, a tooled correct "S", an applied correct "S", and this New Life mold example. Wow They must have really tried everything to make the brand a success, or simply made different versions based on whatever they were blowing at the time. Dale M.
I hadnt seen that varient either. Arent the Perry's Last Chance (Perry Pratt) and the Bitterwitch, members of the "Pratt line" as well? Not sure if McBoyle was involved in those though. Would be interesting to look into Mr Pratt a little more...... He seems like a classic "snake oil" man of that era out in the West. 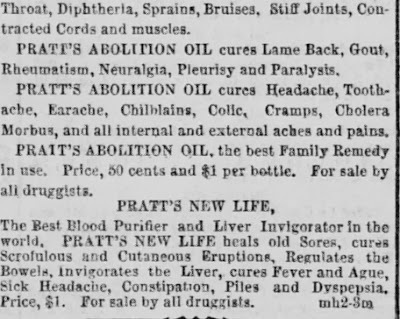 There also exist an early 1870s “Pratt’s Abolition Oil” that is larger than the standard size, cobalt blue and has an applied lip. Wow I would like to get me one of those!